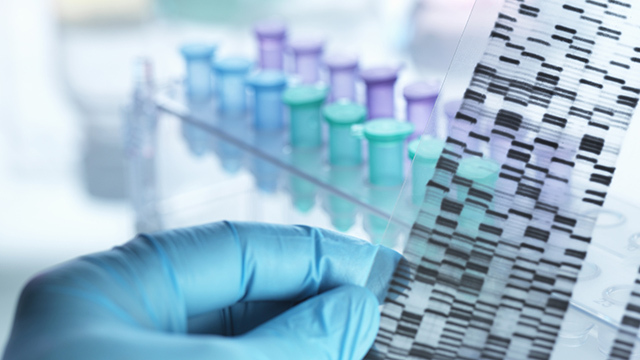 About half of Americans (52%) believe that within the next 50 years science will find a way to eliminate virtually all birth defects through gene editing. 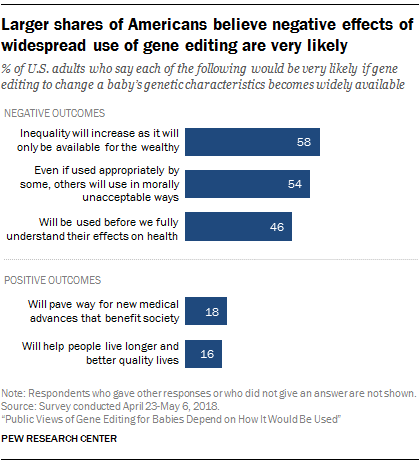 But majorities of Americans harbor at least some reservations about the impact on society of more widespread use of gene editing, according to a new Pew Research Center survey. 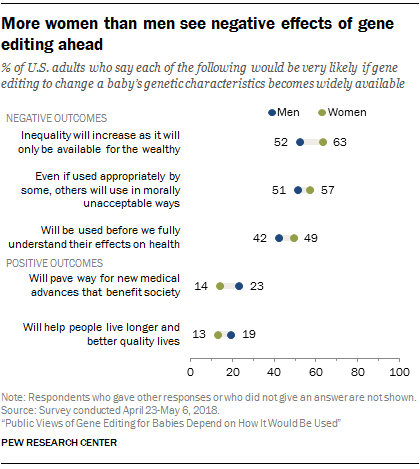 Roughly six-in-ten Americans (58%) say one very likely negative effect that will result from gene editing is that it will increase inequality because it will only be available for the wealthy. Another 54% express concern that, even if gene editing is appropriate for certain purposes, it will lead to a slippery slope, with some using it in morally unacceptable ways. Far fewer Americans see upsides if gene editing for babies were to become widely available. About one-in-five (18%) consider it very likely that gene editing would pave the way for new medical advances that benefit society, and 16% have a similar degree of confidence that it would help people live longer and better quality lives. Roughly a third or more consider each of these as not too or not at all likely to transpire. Those who say they have heard a lot about gene editing to change a baby’s genetic characteristics are more inclined to expect positive outcomes from its widespread use – 36% of this group say it would very likely pave the way to beneficial medical advances, compared with 16% each of those who have heard a little or nothing about gene editing. But overall, those most familiar with gene editing are also more likely than those with no familiarity to see downsides ahead. For example, 64% of those who have heard a lot about gene editing believe its widespread availability will very likely lead to increased inequality because the technologies will only be available for the wealthy, compared with 53% of those who have heard nothing about gene editing for babies. Overall, women are more likely than men to expect negative effects from the widespread availability of gene editing. Some 63% of women vs. 52% of men think it very likely that gene editing will increase inequality because it will only be available for the wealthy. And 57% of women think it very likely that gene editing will be used in morally unacceptable ways, compared with 51% of men. Men are more inclined than women to expect positive outcomes from the widespread availability of gene editing. Men are also more likely than women to see gene editing for babies as an appropriate use of medical technology.